Why buy ready made groundbait? It can be really expensive to buy, it can be confusing with there being so many to choose from, how do you make a choice of what is right for you without wasting money in the process? Well for me I don’t bother with store bought groundbait; it has it’s places, if I’m in a rush or going last minute having a bag of ready made is great but if I have the time I make it myself. It’s simple and I find it very rewarding to catch on something I’ve made myself. I make groundbait up with what I’m using it for in mind. Do I want a groundbait that is going to cloud through the water and help me catch up in the water and on the drop or do I want something that is going to sink and break down slower forcing the fish down to the bottom? It totally depends on the situation I find myself faced with on the day. The groundbait I made up for my last session needed to fill a duel role. I wanted it to work on the method feeder but also work as normal groundbait. So what to put in it? I needed it to be able to stick to the method feeder in flight and while falling through the water but I also wanted it to be able to break apart once the fish found it and started feeding. To solve this problem I raided my partners parents house of their leftover bits of cereals. I collected together some bran flakes, shredded wheat and rice crispies. The reason being is that they should to my mind all give off malty sweet smells, they should be sticky when dampened down and finally when bits do break off some might float up etc. Especially with the rice crispies, they floated about and could be seen rising through the water on introducing the bait. Add the bread to the processor, I blitz up 4 -5 pieces at a time. I made this into a fairly fine crumb. Empty this into the bucket as you go. Add the bran flakes to the processor. Again I blitzed this to a fine powder. Empty this into the bucket as you go. Add the shredded wheat to the processor. This I did in varying consistences, some fine some more course. Add this to the bucket as you go. Add half the rice crispies to the processor and blitz to a powder and add to the bucket; the other half add straight to the bucket. Add the fishmeal pellets to the processor. I made these into varying sizes, some powdered up totally with other bits around 2mm to 4mm. Once these had all been blitzed etc and added to the bucket I added the custard powder and mixed thoroughly. Then I blitzed the corn, I left it fairly chunky. This was then mixed into the bucket. This was then covered over with cling film and left to stand over night. Mixing it up on the day, for the method I made a fairly damp mix to get it to stick to the feeder. For close in work I left it a little bit drier to help it break down quicker. The final mix will have a very malty sweet smell to. I’m not going to lie it smelt almost good enough to eat!!! The groundbait was easy to use close in and with the water only being 3-3 1/2 feet deep I could see a nice cloud form as the bait went in. It wasn’t a thick cloud so most of the bait went down to the bottom but there certainly was a trail left in the water. The rice crispies worked great with some staying on the surface when the bait went in and other rising to the surface after a while. I’m sure this helped in catching me some of the lovely rudd I had out on this session. As I’m sure you know they tend to eat up in the water, so I think that the rice crispies breaking off on the way down and coming to the surface may of helped bring them onto the feed. As for the method feeder I’m not too sure what conclusions to draw. It stuck to the feeder well, I was able to cast easily and at distance as well, so no issues there. As for fish; I caught four in total with a number of bites missed. However it really wasn’t brilliant to be totally honest. Not sure why, it may have been the groundbait, however the fish had only just spawned last week (the carp at least) so it may of been that, I really don’t have an answer. What I may do is add more fishmeal to the mix; this may help pull the fish to the feeder I think. So overall brilliant in close, I caught rudd, roach, perch, bream and carp over this groundbait. On the method feeder it kind of didn’t work as well as I hoped it would. Another thing I tried out on my last session was adding some spice to the fishes diet. Nothing difficult to this at all. For the sweetcorn I got some dried chili flakes and added them to a food bag and then dumped the sweetcorn juice and all in there as well. A good shake up and it went into the fridge. For the meat I cut it up into hook size cubes, again I grabbed a food bag, to that I added some medium curry powder and then added the meat. I gave the bag a good shake and made sure there was a fairly thick crust of spice on the meat and the put it in the fridge. Well the sweetcorn seemed to work wonders as free offerings, the fish seemed to go crazy for it. Strangely though I didn’t get much on the hook with it though. 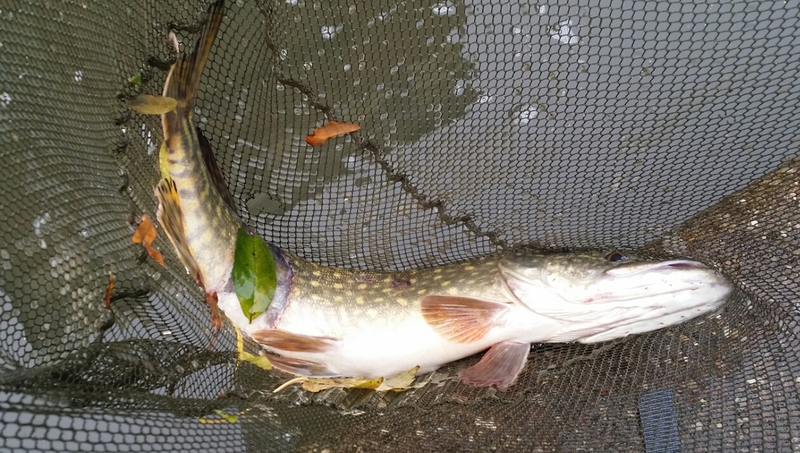 That really made no difference though as they came onto the feed with force when I added it to the swim. The meat, what can I say about the meat!? Did it work? You bet it did! At one point I’d used 10 pieces of meat for 10 fish inc some lovely rudd and bream. The bites came almost instantly and I caught on it throughout the day. With it producing some nice carp later in the day as they finally came into the margins. So folks that’s how I did it and on the whole it worked well. I love making my own bait. It’s cheap which is great but also making it yourself and knowing it works is a great felling of accomplishment. I feel more connected to what I’m doing knowing I made the bait that caught that fish. It doesn’t take a lot of knowledge to do and it saves you money, which in the long run might mean more fishing which can only be a good thing. That’s it from me folks. Not had much time on the bank over the last week in all honesty. It’s been one of those weeks at work!! I did manage a quick 3 hours session on the 13.6.16. I woke up to a wall of rain. Don’t get me wrong I’m not averse to getting wet in search of fish. However the shear force of water made me reconsider my plans of going to a lake that morning. So I waited for it to clear up and made a trip to Alans Tackle shop, St Johns Worcester for some maggots and a couple of floats as I have a problem not buying floats!! Alans tackle is a great shop, lots of choice from floats to everything you can think of. It’s a real Aladdin’s cave being inside what I think used to be an end terrace house. So it can be cramped in there with every possible space taken up with stock. I picked up an antenna type float and a clear insert waggler both by Drennan. I was just getting to grips with the antenna float when a swan decide to take exception with it and attacked it, snapping it in the process!! So one thing to note about this float it’s not able to stand up to an angry swan!! That would also mean be careful if you accidentally cast it into cover etc. What time I did have with this float was good; it’s very, very sensitive so great for small fish and for fishing with pinkies or squats. One thing I did find difficult was getting the shotting right, I wanted it just showing one yellow band. I found this a little hard to achieve as I didn’t have anything smaller than a no 6 weight. I’ve been trying to fish for some bait fish for live & dead baiting and this seems like it would have been great for that due to the massively increased sensitivity; thanks swan! The insert waggler I got on my trip to the tackle shop is fantastic. What a brilliant float, easy to shot, great casting with brilliant accuracy and they seem to be made of very tough material. The tip is super bright and the float is very sensitive. If you need an insert waggler then I highly recommend these. Easy to get hold of and fairly cheap. The fishing it’s self was great. I only went for some time to relax and chill so I was only using maggot over micro pellets. With the the change in weather I was confident in the fishing coming on the feed and they did so. In three hours I had approx thirty fish. Not bad really; nothing massive but some nice looking fish. I did hook into something I think was a nice perch but it slipped the hook after 30 seconds as I think I struck a bit too soon. I don’t like deep hooking perch and this is what I was mostly catching so I decided to be cautious. What I did learn from this session is what size is possibly good for live baiting. My purpose for live baiting is to target the larger perch and pike that I fully believe reside in canal near me. A good size live bait. Now I’m not sure of your feelings on live baiting but for me as long as you don’t over fish I can’t see the issue. I have no intention of taking any more than 3-4 fish for live baiting. I only intend to fish one at a time; the others will be in a very large bucket with fresh canal water to be introduced regularly to ensure they have enough oxygen. If I don’t need them I will let them go. I intend to use perch and bleak as live bait; the reason being I can catch 30 of these fish in 3-4 hours I don’t see how this will damage the eco system seeing as they are the natural food of what I am trying to catch. Yes there are other methods to catch these fish and I use them but it doesn’t mean if you’re responsible you can’t use live or dead baits. I found this beauty on Ebay, it’s 6 10 and described as a spinning and ledger rod. I’m going to use it for close in canal fishing, spinning and light lure work on the river. I’ve never used a split cane rod, my Dad did have one if my memory isn’t playing tricks on me but I can’t remember using it as I think it was too heavy for me at the time. I’m very excited to get this and have a go with it!! Hopefully it will be here in time for the river season!! The results of my groundbait experiment, it was hot but lots of fun! So last time I was making my own groundbait; it had been a while since I’d done it so I was interested to see if I still had the magic touch! So on the 6.6.16 me and my friend Ben made the long 30 second trip to the canal; followed by a twenty minute walk further up the canal!!! We choose a spot that looked ideal, reeds in front with a sunken tree; we were spoilt for choice. Or so it seemed. We got there for around half 9, I plumbed up and worked out we had around 5-6 foot of water where we wanted to fish. We baited the swim up with a nice carpet of groundbait and waited. The time ticked by, groundbait went it and not much happened. I managed a couple of small perch but that was all. I was using an insert waggler, nothing too big but there was a bit of tow so I went with a float that could deal with that. I love insert wagglers when fishing with maggots or just in general for light float fishing; they’re especially good I find for perch. As perch have a tendency to wolf the bait down I find these floats are good for showing the slightest nudge. Personally I prefer to strike and miss than possibly deep hook and injure a perch. So the insert waggler for me helps greatly in showing when is the best time to strike. My friend Ben was having trouble with his reel; it turned out that as he does mainly feeder fishing and the drag on his reel was set far too lose for float fishing. I found out while teaching him the basics that it can be quite hard to teach someone the finesse of small light float fishing when they come from a carp/feeder background. After trial and error he got the hang of it. So after 4-5 hours of grueling fishing that only produced two fish we decided to move. I had previously fished a spot almost on my doorstep and it had produced a decent amount of fish. So we set out in the blistering heat to walk all the way back to where we started. The next time anyone says to me, “fishing’s just sitting around” I think I might politely tell them to go forth and multiply. So a few pounds lighter around the waste from our trek we arrived at our new spot. This is just by a bridge and a lock. The water is very shallow, only approx a meter at the most. So I stuck with the insert waggler but I scaled it right down, groundbait in, maggot on hook we started again; with a BANG. I genuinely could not believe it, I knew they were there. I had said to Ben that I’d love to catch one but that we’d probably need different tactics to get them. Fifteen minutes later this happened!! On two red maggots. It fought like crazy and while I’d heard stories about how hard they are to handle on the bank but I was not prepared for the carnage it would cause. Being near a bridge and a lock this is a very tight spot with a fair amount of foot traffic; nothing too bad if you’re careful. Well with the two of us scrabbling around on the deck and bikes backing up it was bedlam. Most people walking past on the canal think any fish is amazing, the site of an eel though caused instant shock and bemusement. One person thought I’d caught a snake. It truly was a moment I won’t forget and these moments are the reason I love fishing; the reason I keep going back. You never know what might happen and when something like that does happen it’s like being a kid again. This canal so far has given me my PB perch and my first ever eel and all thirty seconds from my front door!! Can’t complain at that. Bens new PB roach, what a beauty it was as well. Till this point I’d not seen any roach in the canal; logic told me they’d be there but even with bread crumb groundbait they hadn’t turned up until this beauty came along. All in all it was a great day; very difficult in the morning but the change in spots made the afternoon one to remember. I think the reason for the lack of action in the morning is the fact that the distance between locks on that stretch is so far that if you’re not on them you won’t catch. I’m going to get on my bike and explore a bit more I think. The fact that I have such a good spot so close to my house is amazing and I feel very lucky to have it!!! Also I was very pleased with how well my groundbait mix worked; apart from the swimstim ground bait and the hemp it’s cheap as chips. You can do without these and use cheap pellets available in all tackle shops and I’m positive the results will be similar. Plus it’s nice to catch on something you’ve put the time in to make, it just feels that much more satisfying! With that in mind me and Ben are looking into make our own floats. Stay tuned for more on that! I’ve been doing mostly lure fishing at the moment in the form of Jig and Drop Shot fishing, I’m loving it loads but I know the canal near me holds quite a lot of other species. So with that in mind I’ve invited a friend to join me on a more all round course day. He’s never fished a canal and is not that experienced in using the float. So it’s a bit of a foray into the unknown for the both us as I’ve not hit the canal in search of much other than Perch so far. Keeping it simple really. I love simple float fishing and the canal I find demands that, fine line, fine hooks and smallish floats. Groundbait: This is going to be a mix I’m making myself (I’ll cover the recipe lower down); I’ll be applying the little and often approach to this. So to begin with 3 balls approx the size of tangerines; each to be of a different hardness to allow for different rates of breakdown. The idea being this will create a nice thick cloud and also a nice bed of bait. After that I am going to put in roughly walnut size balls every 15 mins; making them not too hard not too soft so that they have a medium rate of break down. Lose feed: I intend to put a variety of lose feed into the groundbait except for meat. Therefore free offerings will be limited to small amounts of maggots. This is a mix I have used many times; mainly on lakes but it has worked well in the past for me so I see no reason why it won’t this time. I use this as the base mix for most of my groundbaits, if it’s winter I swap the angel delight/milkshake for chill or curry spice. In terms of additional content there is no right or wrong answer. I’m putting these in for a couple of reasons. The hemp because the canal should be full of silver fish and they love it along with the chili. The pellets and the groundbait, two fold really I’m making groundbait for two people and for the canal. So I want a lot of it and I want something that will draw the fish to us. I have lots of confidence in Swimstim, in fact I have lots of confidence in all the Dynamite Baits range to be honest. I know it catches fish so that’s why it’s in there. The bloodworm pellets are simply there to bulk it out and also to attract fish in as well. Before going further: you will need a food processor to make this groundbait mix. Along with a large bucket and a groundbait riddle. Right so we’ve got the ingredients; what’s next. First of all you need to allow the sweetcorn and hemp dry out; make sure to keep the juice from both the sweetcorn and hemp. The sweetcorn and the hemp need time to dry out to aid in mixing the ingredients and not making it too wet. If you can’t do this don’t add them until you’re on the bank. I put the sweetcorn and hemp into containers to dry for a couple of hours; over night if possible. I layer the bottom of the container with kitchen roll and then cover them with more kitchen roll, applying pressure to squeeze excess juice out. To begin with I blend all the sweetcorn up; you can choose to do half and half if you now there might be large fish at the venue. Once this is blitzed I do the hemp; once that has been done I put the sweetcorn back in till the two are blended together. I then take this and put it to one side and clean the food processor. Next take the bread and blitz it, some people cut the crusts off and do them separate or save them for hook bait.I throw it all in together. You want it to be a nice fine consistency. Put the bread in the bucket. I then blitz the pellets, I don’t want this to be total powder. I like to leave some bigger bits in. Once done add to the bucket. Next add the swimstim to the bucket. Then the other ingredients, so angel delight, custard powder and salt. This is thoroughly mixed, I do it by hand but you could attach a whisk to a drill and do it that way. Once mixed I pass through the riddle, this leaves you any large bits; blitz these and add back to the bucket. At this stage you have a viable groundbait; all it needs it water. I however like to add the sweetcorn etc for that bit of kick. So next take the sweetcorn and hemp mix and add to the bucket. I do this a third at a time, making sure to mix it thoroughly. That’s the mix done and ready for the next day!! I cover mine in cling film to keep flies and the cat away from it. On the day you need to add the maggots, I use dead maggots as they can’t escape and burrow into the silt. To do this take your maggots and put them in a bait box, boil a kettle and then cover the maggots in the water. Leave for 5 mins and then drain and add to the bucket. When you get to the bank take the liquid saved from the hemp and sweetcorn mix until it is a smooth consistency that can be rolled into a ball that holds together but breaks apart easily when you apply pressure you may need more water, always use the water from the venue. Leave it to stand for 10 minutes; just enough time to set your rod up. After you’ve left it to stand check the consistency; it may require more water. You want an even wetness to the mix, too dry and it will be too cloudy, too wet and it will take too long to break down. As I’ve said I’ve used this mix before and it will attract all manner of fish from Carp to Roach and everything in between. So hopefully on the canal it will work to bring the fish in and have enough power to hold them. I’m writing up how it went at the moment, so check back soon!!! !